17th annual MAU Conference held in Washington, D.C.
A delegation of UMBC Africana studies students recently joined teams from three continents for the 17th annual International Model African Union (MAU) Conference in Washington D.C., hosted by Howard University. Participants represented the 54 countries on the African continent in the simulation event, discussing economic, social, political, and security issues. 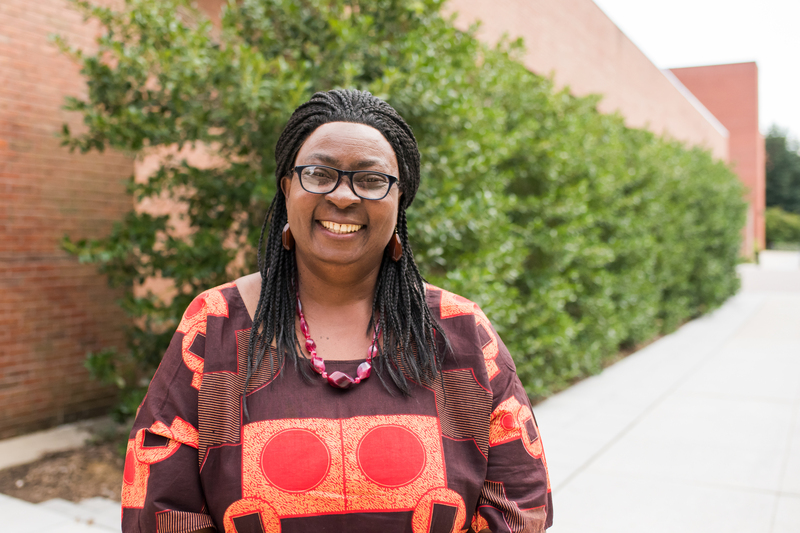 Gloria Chuku, professor and chair of Africana Studies. Photo by Marlayna Demond ’11 for UMBC. UMBC’s team included Damarius Johnson ’19, Africana studies; Maurice Cates ’21, Mahlet Gebre-Egziabher ’21, and Marion Sillah ’22, political science; Kemi Biaou ’21, biological sciences; and Enzo Walker ’20, computer science. The group represented the southwestern island nation of São Tomé and Príncipe. Johnson served as head delegate and member of the simulation’s Committee on Pan Africanism and Continental Unity. In preparation for the event, he led the independent study group in researching the country’s history and current status. This advance preparation proved essential for drafting policy proposals to present to parliament during the simulation. Participants started the conference at the African Union (AU) Representational Mission in Georgetown. A panel of scholars of Africana and diaspora studies, including professor Chuku, and a member from the African Union Representation Mission led a question and answer session on significant topics discussed by African policymakers today, a half-century after independence. The session included discussion of economic development, youth employment, female genital mutilation (FGM), LGBTQ civil rights, collaboration with countries in the African diaspora, and the emigration of high-skilled African professionals to other continents. Over a four day-period, committees presented their proposals during a simulated session of the Pan-African Parliament. They followed parliamentary procedure, led by a student chair, parliamentarian, and vice chair. Committees presented, debated, and amended their proposals during the moderated caucus, before moving on to negotiations and proposal revision. They then submitted the revised proposals for a final vote leading to a resolution. Johnson asks for permission to speak during parliamentary proceedings. Photo courtesy of Chuku. 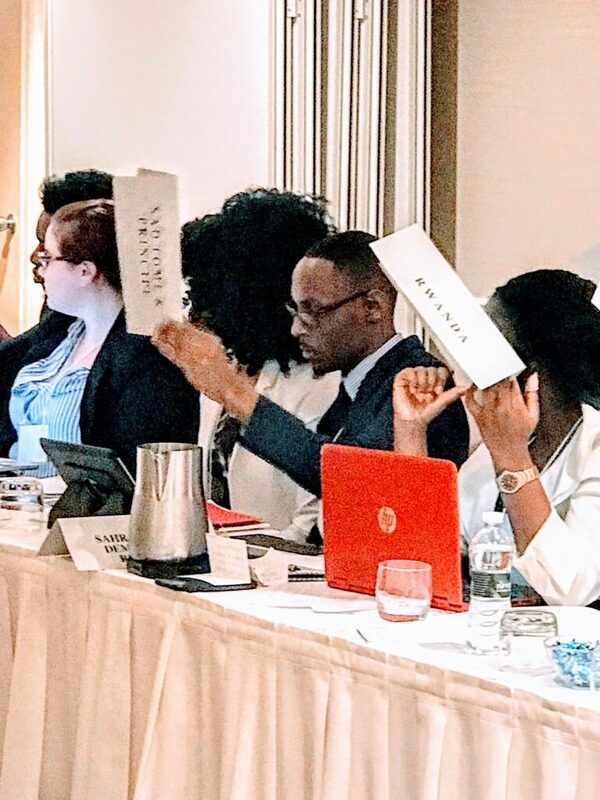 In addition to the committee proposals, the event also included a simulated crisis situation, managed through the African Union’s Executive Council. This year’s crisis was a contested election in the Democratic Republic of Congo, with allegations of voter fraud. The simulation proved to be a pivotal moment of inspiration for the UMBC delegation. They were excited to live out their aspirations as leaders in supporting the development of a stable and prosperous Africa. Cates hopes to become a lobbyist and Johnson will soon head to a Ph.D. program in history at The Ohio State University. As African American students who see themselves as part of the African diaspora, but have not had an opportunity to travel to Africa, they particularly valued the chance to speak with African representatives who were at the event. “It was a unique opportunity to discuss issues like pan-Africanism and current affairs in African countries with Africans who have an investment in their countries,” shares Cates. Both Biaou and Walker aim to eventually return to West Africa to contribute, as professionals, through STEM, business, and education initiatives. Silla, who left Sierra Leone for the United States to avoid FGM, hopes to address FGM and economic issues facing women in Africa. She sees her UMBC experience as giving her a strong foundation for that future work. Banner image: [L to R] Biaou, Walker, Sillah, Chuku, Johnson, Gebre-Egziabher, and Cates holding their certificates of completion. Photo courtesy of Chuku.